What would it be like to wear hanbok to work every day? Sitting across from hanbok designer Damyeon Lee Hye-soon at lunch earlier this month, my curiosity was piqued. I had seen her in hanbok on the streets of Mumbai, the crisp hanbok standing out among the sea of sari. I had seen photos of her on a bridge in Paris, her skirt swaying with the breeze. A week later, I was at her shop getting measured for a hanbok. It had been 18 years ago that I had my last hanbok made. Damyeon took measurements at five different points, repeating the process twice, feeling the back of my neck and back with her palms. She showed me a specially designed petticoat that gives her hanbok its characteristic silhouette. 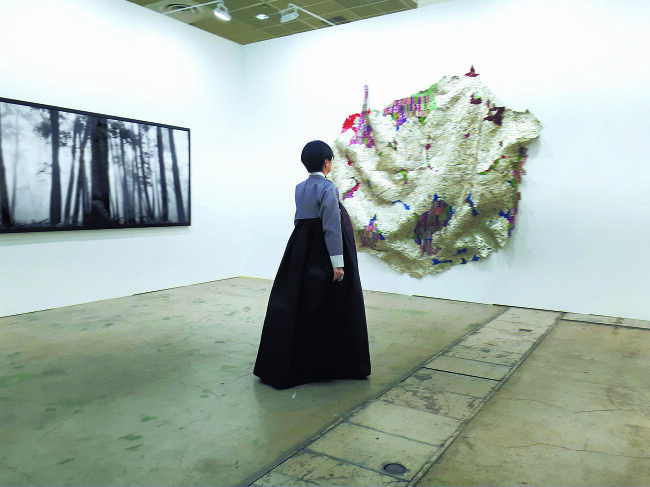 It so happened that the “hanbok challenge” kicked off on the preview day of Korea International Art Fair at Coex. Walking into the vast exhibition hall was unnerving, but I soon adjusted. I had to explain to the acquaintances I ran into why I was walking around in hanbok and most of them burst out laughing and wished me luck. A French gallerist took a photo of me viewing a piece by Ghanaian artist El Anatsui, explaining that she would send it to the artist to show that his work was in Korea. A Korean woman asked if I were a volunteer. When I said no, she muttered, “Oh, you were wearing hanbok, so I thought….” Some people thought I was an artist and said hello with a respectful bow. I was so flustered by the experience, I got lost in the parking lot. It took 30 minutes to find my car by which point I was exhausted. 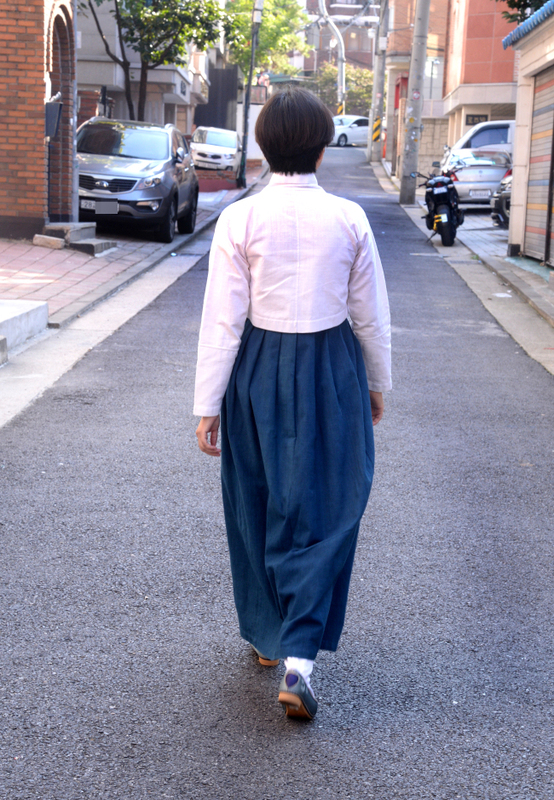 The next day, my mission seemed simpler: wearing a more modernized hanbok in cotton. The jacket is longer, the ribbon used to tie the jacket is much shorter and narrower and the dress is less full and hits just above the ankle. There is no petticoat. However, I quickly realized I was mistaken. It was a form of hanbok I had never worn before and while it was easier to move around in, I felt very self-conscious. Colleagues’ responses varied from “You look like a patriot” to “Pyongyang fashion?” My discomfort stemmed from the fact that I did not feel like myself in a hanbok that is typically associated with activists and people who espouse eco-friendly living. If your sartorial choice is an expression of yourself, this really was not me. Going to Sunday service required taking an elevator, rather than walking up four flights of stairs. Elderly women of the congregation seemed pleased at the sight of a beautiful hanbok, giving me a knowing nod. At work, I wondered if I would be able to meet my deadline wearing hanbok – on my typical writing days, I resort to wearing comfy sweatshirts and pants. I need not have worried. You can still type at a furious pace in hanbok sleeves. In fact, I found driving was no big deal either, despite my daughter’s dire warning against it. “You might get your skirt caught on the brake and kill someone,” she had said. Our hoesik, or office dinner, at an Italian restaurant in Seochon, a neighborhood known for hanok, or traditional houses, proceeded just fine without any spills or tripping over. A colleague jokingly said he had picked the restaurant so that people would not mistake me for the owner. Korean restaurants often have owners in hanbok greeting diners. 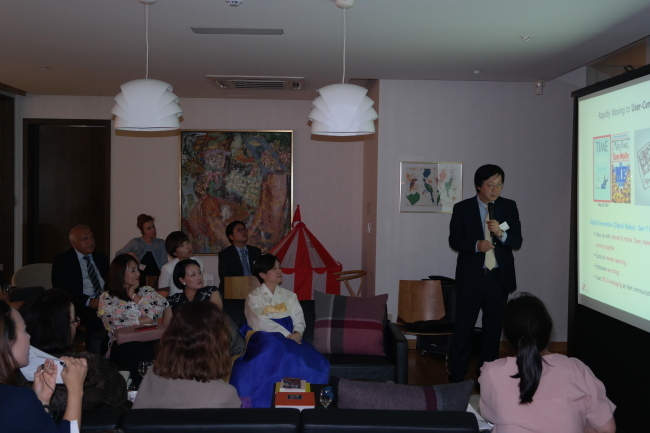 At an evening event at the Danish ambassador’s residence, I stood out in my colorful attire. But by this time, I had become comfortable enough that I did not feel awkward despite the questions and compliments.